In our last ‘Arriving Home’, we explored one of the two main ways in which people often arrive to meditation. Today, we will share the other route through my own personal path to meditation: how meditation found me. Mindfulness teaches us that everything we need to be mindful already exists within us. Even better, each and every one of us has experienced mindfulness before. Any time you have rested your attention upon a beautiful sunset, appreciated a breathtaking view of nature or been absorbed in a hobby - this is being mindful. Your attention is in the present moment with the beautiful scene, or in the present moment action of your hobby. Looking back, I realized my first experience of being mindful was through the love I had for being in nature. I grew up in the middle of rural farmlands and cornfields in Ohio. There were not any neighbors with children my age, the nearest (very) small town was a 10-minute drive away. So perhaps it’s easy to see, my childhood playground was the forest and the farmlands. I remember spending hours outside, sitting by the river that ran through the woods near my house. My summers consisted of rotating between reading all day outside on the back porch and taking a hike in the forest to sit next to trees, find wild flowers and see the deer and birds. Being in direct communion with nature gives you access to sensations of well-being and feeling whole. I felt very clear and in touch with who I was as a kid, which set the stage for being inherently keen to meditation many years later when the practice found me. I struggled quite a bit in middle school and high school for one reason or another. From typical problems with authority, to not believing in the structures of school government, to not feeling like I belonged in any of the schools I went to. My parents being the very caring, open-minded people that they are (which you can read more about here) decided to try a more alternative schooling route with me and sent me to wilderness-based high schools in Utah and West Virginia to finish my last semesters of high school. Here, is where I encountered my first “silent retreat”. As I backpacked through the Utah mountains for two months and went on a 4 day “solo” in the middle of nature - with just me, a fire starter kit and my tarp tent. No visitors, other than a really big moose, or human contact for 4 whole days. I remember realizing just how connected I felt to my true self - even as a teenager. I learned then, when you are out in the silence of nature you can’t help but find your own inner-silence too. My last high school was in the Appalachian mountains of West Virginia, which is where meditation first found me. In this alternative school setting, I was trained in search and rescue and was taught the South American philosophy of the “four winds” from the school’s staff of Native Americans, a prince from Africa and local Appalachians. Each of the four winds, North, South, East and West, represented an aspect of self-development and embodied the virtues and qualities of an archetypal energy. I was taught to follow my breath in meditation sessions where we were led through visualizations on these archetypes and teachings of the four winds. I didn’t know it then, but this was truly the beginning of my meditation practice. My graduation from this high school consisted of a drum circle and an ancestral ceremony of a “rite of passage” where the young person steps through the doorway into becoming a whole and healthy self-actualized adult. After my rite of passage ceremony, each time I encountered a moment of struggle as a young adult, I would think back to my time meditating in West Virginia, and I would feel centered and more at peace again. In college I ended up studying Holistic Health and Wellness from an Alaskan Shaman ER Nurse who was head of the department, where the curriculum had “mindful nutrition and life-centering classes” that taught the fundamentals of mindfulness and meditation. So naturally, I was being exposed to and learned meditation even more through my schooling. At the age of 21, I came to a moment of true hardship and trauma. That moment - where the rug is pulled out from under you and you have no idea who you are anymore. In this dark night of the soul and a true rock bottom - it happened again. Meditation found me through a book this time. This book was the only handle of truth I had to hang onto. It was the light in the darkness pointing me to my own inner-truth whispering it was time to begin, find a teacher and learn a daily meditation practice. I was ready to get serious about meditation, and when the student is ready the teacher always arrives. I went out and sought a daily meditation practice because I knew, intuitively, meditation was my path towards healing and becoming whole again. I looked back and remembered how good I had felt previously, during and after meditation. The call was there. I had seen and followed all of the signs, and like I have taught before, a beautiful choicelessness just seemed to arise. I had absolutely no choice, but to show up and arrive to meditation. My devotion to meditation came because I knew I needed the support in re-finding who I was again after my trauma. I knew I had to go inwards to find myself again. Meditation and mindfulness how-to articles keep showing up in your inbox or newsfeeds. A book or audio meditation lands in your hands right when you are needing some extra support in your life. You find a teacher. Someone you just know is the one you are meant to truly learn meditation from at this time. My suggestion is to listen to the signs and follow these messages from life and the universe. 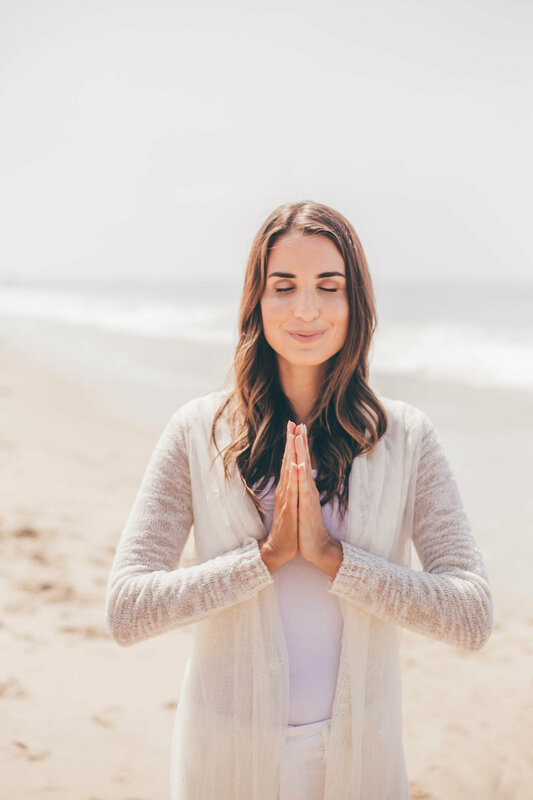 If meditation had not found me during the many points that it had throughout my life, I would not have known it was exactly what I needed when I was searching for help the most. Even if the path pushing you towards a meditation practice doesn’t seem straightforward or linear enough, there is a reason why meditation is finding you. To some degree, the practice is always trying to point you back home to who you already are, and your natural state of mindfulness and well-being within.